As immediate and relevant as today's headlines, this book sets forth a bold argument with direct implications for political life in America and around the world. Combining incisive cultural analysis and keen religious insight, Robert Jewett and John Shelton Lawrence maintain that American crusading -- so powerfully embodied in popular entertainments -- has striking parallels with Islamic jihad and Israeli militancy. According to Jewett and Lawrence, American civil religion has both a humane, constitutional tradition and a violent strand that is now coming to the fore. The crusade to rid the world of evil and -evildoers- derives from the same biblical tradition of zealous warfare and nationalism that spawns Islamic and Israeli radicalism. In America, where this tradition has been popularized by superheroic entertainments, the idea of zealous war is infused with a distinctive sense of mission that draws on secular and religious images. These crusading ideals are visible in such events as the settling of the western frontier, the World Wars, the Cold War, the Gulf War, and America's present war on terrorism. In exploring the tradition of zealous nationalism, which seeks to redeem the world by destroying enemies, the authors provide a fascinating access to the inner workings of the American psyche. They analyze the phenomenon of zeal -- the term itself is the biblical and cultural counterpart of the Islamic concept of jihad -- and address such consequential topics as the conspiracy theory of evil, the problem of stereotyping enemies, the mystique of violence, the obsession with victory, and the worship of national symbols such as flags. This critical book, however, is also immensely constructive. As Jewett and Lawrence point out, the same biblical tradition that allows for crusading mentalities also contains a critique of zealous warfare and a profound vision of impartial justice. This tradition of prophetic realism derives from the humane side of the biblical heritage, and the authors trace its manifestations within the American experience, including its supreme embodiment in Abraham Lincoln. Isaiah's -swords into plowshares- image is carved on the walls of the United Nations building, thus standing at the center of a globally focused civil religion. Grasping this vision honored by Judaism, Christianity, and Islam alike includes recognizing the dangers of zealous violence, the illusions of current crusading, and the promise of peaceful coexistence under international law. 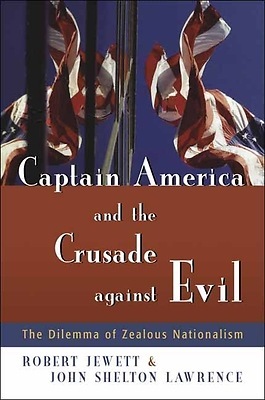 Instructive, relevant, and urgent, Captain America and the Crusade against Evil is sure to provoke much soul-searching and wide debate.